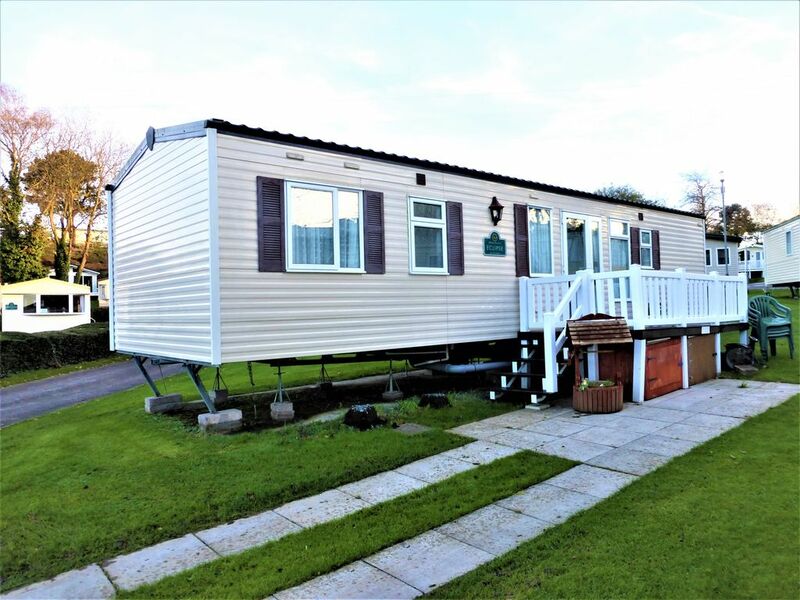 Our gorgeous 3 bedroom unusual design holiday home with sun terrace, Wild Rose, occupies a sunny plot on Lytchett Bay View a few minutes walk from the beach. The caravan is comfortably furnished to a high standard. It is double glazed and central heated. From the door it is a short walk to all amenities and downhill to the lovely sandy beach with cafe and water sports (charges apply on site). There is parking for two cars. The kitchen/dining area has a 4 burner gas hob and oven with extractor fan, integrated fridge and freezer, microwave, kettle, toaster and is fully equipped with all kitchen utensils, crockery and cutlery. The extending dining table can seat 6. The lounge area has an electric fire with stylish surround; comfortable seating that converts into a double bed; a digital 32" flat screen TV with Freeview. The master bedroom has an en-suite shower room with toilet and basin and large fitted wardrobe which provides loads of space for your clothing. The other 2 bedrooms are twins with wardrobes and bedside cabinets that share a shower room with toilet and basin. Wild Rose caravans are dog friendly. There will be no extra charge for your dog, providing no damage is done and no extra cleaning is required. Please let us know when booking if you would like to bring your dog as conditions apply. Duvets and pillows are provided however you will need to bring bed linen, towels and tea towels. Fully equipped with all kitchen utensils, crockery and cutlery. The kitchen/dining area has a gas hob and oven with extractor fan, integrated fridge and freezer, microwave, kettle, toaster and is fully equipped with all kitchen utensils, crockery and cutlery. The extending dining table can seat 6. There is a small selection of DVDs in the caravan. Wild Rose has a veranda. Fun Works passes are not included in the price. Entertainment passes can be bought from Havens reception on or before arrival. Please note park facilities are open from Easter to end of October. Toen we aankwamen was niet alles in orde. Maar na waarschuwen eigenaar is dit alles meteen hersteld. Erg vriendelijk! Sehr gute Unterkunft mit allem, was man im Urlaub braucht. Die Küche ist sehr umfassend eingerichtet, es fehlt an nichts. Eine Einkaufsmöglichkeit ist gleich um die Ecke fussläufig zu erreichen, genauso wie der Strand. Die Vermieter sind sehr nett und haben alle unsere Wünsche erfüllt.